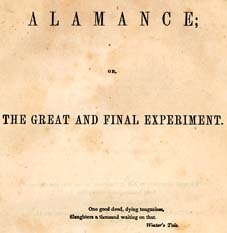 Calvin Henderson Wiley, 1819-1887 Alamance; Or, the Great and Final Experiment. Alamance; Or, the Great and Final Experiment. Alamance County (N.C.) -- Fiction. Teachers -- North Carolina -- Alamance County -- Fiction.